Aquifer congratulates our own Amit Shah, MD, FACP, AGSF, of the Aquifer Geriatrics Course Board, on being chosen as American Geriatrics Society Outstanding Mid-Career Clinician Educator of the Year Award. Dr. Shah was chosen as this year’s winner for his work as an inspiring mentor, attentive clinician, and innovative development of web-GEMs (now Aquifer Geriatrics). The Outstanding Mid-Career Clinician Educator of the Year award is given by the American Geriatrics Society to a junior faculty member for an impressive body of work in geriatrics education, with significant contributions to training students and advancing geriatrics education. The award was presented on May 4 at the AGS National Scientific Meeting in Orlando, Florida. 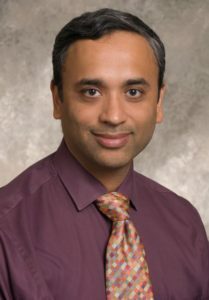 Dr. Shah led the development of web-GEMs (now Aquifer Geriatrics), and served as the co-Primary Investigator of the Reynolds grant which created the course. He continues the work of providing high-quality virtual patient cases to geriatrics learners as an Associate Editor for the Aquifer Geriatrics Course Board. Currently, Dr. Shah leads the longitudinal geriatrics curriculum and co-directs the internal medicine residency continuity clinic as an Assistant Professor of Medicine and Associate Dean for Faculty Affairs at the Mayo Clinic School of Medicine in Arizona. Previously, Dr. Shah was the Clerkship Director for Internal Medicine at the University of Texas Southwestern Medical school, where he worked to integrate geriatrics into the curriculum. During his time in Texas, he also helped to facilitate the Southwestern Aging and Geriatrics (SAGE) program, was elected to the UT Southwestern Academy of Teachers, and received a number of teaching awards.